Award winning storyteller Cyndi Freeman, presents a solo-show about hoaxes, bullies, and monsters. 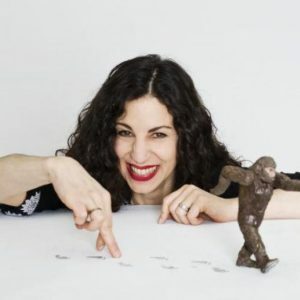 Weaving together true tales of a hoax perpetrated against her when she was 11 years old and trivia about the Bigfoot myth, she has created a show about the resilience it takes to survive childhood. A tightly written and well performed personal narrative, Big Foot weaves autobiography, history and popular culture into a compelling tale of childhood and growth. Equal parts touching, educational and funny, this show offers enough to pull it above the typical “this is my life” one-woman show. I particularly liked the usage of hoaxes, myths and monsters to add whimsy to a story otherwise grounded in the cruelty of children. I don’t actually have a lot to say about this play because I think it genuinely speaks for itself! The props, pace and performance of this piece reflects the professionalism of Cyndi Freeman and is a fun show for those looking to revisit and reimaging growing up. Anyone who’s never been bullied is terribly lucky or totally isolated. But Cyndi Freeman presents her youthful recollections with a far more insidious twist, detailing the how her sixth grade classmates turned her teachers into her oppressors and twisted her own sense of right and wrong until at times, she was just like them. Freeman details her childhood anecdotes with a peculiar mix of adult reflection and childhood recollection. She’s 53 and looks 30, and I WAS A SIXTH GRADE BIGFOOT’s greatest onstage asset is her versatile face which at times looks earnestly innocent but then her eyes darken and give her youthful visage an aged horror. Her demeanor for each segment of her story is truly unpredictable, at times caustically grim and at others distantly amused, keeping sixth grade savagery horrific enough to feel it without being so unpalatable as to flee. I WAS A SIXTH GRADE BIGFOOT is particularly effective in presenting the sheer futility of bullying: the need to achieve status through tearing others down only leads to mistrust and fear with even those spared an attack perpetually fearing that they’ll be next. Freeman shares heartbreaking anecdotes where her childhood best friend turned on her, where authority figures decided that bullies couldn’t be bullies because they were popular, and when the emotional intensity is too much, she shifts into into seeming tangents involving an explorer’s futile yet financially viable search for Bigfoot. The Bigfoot anedcotes are a fascianting point of focus in this show with Freeman not quite establishing their relevance and in some ways stepping back to invite audience interpretation. In some ways, Bigfoot’s mythical and undiscovered status allows this supposed creature to be fetishistic object where people project their own longings, obsessions or failings onto Bigfoot. At times, Bigfoot seems to be a place of relief, a safe space where Freeman has a few moments to be free of her classmates. Throughout the narrative, Freeman has a raw, primal ferocity that commands attention matched with a focused, earnest demeanor that feels intimate, almost like her show is being presented only for you, and at times, her performance is so vivid as to be transporting until the listener feels like they are living Freeman’s sixth grade life.